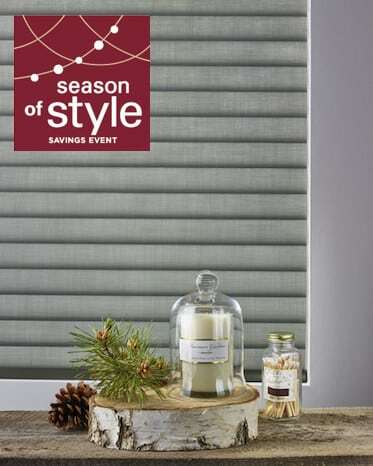 This fall, receive $100 rebate on select Hunter Douglas window blinds and shades. It’s the time of year when family and friends will be gathering at your home during for seasonal celebrations. 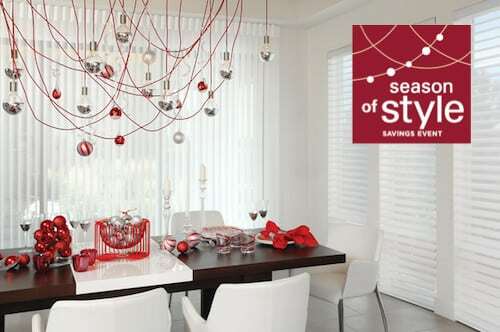 Take the opportunity to get your home ready for the festive holidays with the Hunter Douglas Season of Style Savings Event. Create a warm and inviting environment to welcome your guests and relax in, by updating your window treatments and home décor. You may be putting decorations up for holidays such as Halloween, Thanksgiving, Hanukkah, and Christmas, but there is much more you can do to create a stunning space as we approach more holidays. Windows are the backdrop to your home lifestyle. Choose the right window treatments to transform the entire appearance of your décor. Allow maximum natural light to illuminate your home, or filter it to cast a warm glow. Prefer or need privacy? Block sunlight for a room darkening effect in bedrooms, guest rooms and media rooms. Here is how these 6 Hunter Douglas window blinds and shades can transform your home this fall. Hunter Douglas Luminette® Privacy Sheers provide privacy while still allowing you to view the outside world. Sheer vertical rotating vanes diffuse the sunlight and spread it evenly throughout your home, creating a warm glow. Luminette® Privacy Sheers are a modern twist on sheer curtains. Hunter Douglas Luminette® Privacy Sheers provide privacy while still allowing you to view the outside world. Sheer vertical rotating vanes diffuse the sunlight and spread it evenly throughout your home, creating a warm glow. Purchase 1 Luminette® Privacy Sheer to receive $100 rebate, plus $100 rebate for each additional unit. Bring a striking look to your home interior with the three-dimensional contours of Pirouette® Window Shadings. The soft glowing fabric vanes glide on a sheer backing, providing you with infinite combinations of view-through, light control, and privacy. Bring a striking look to your home interior with the three-dimensional contours of Pirouette® Window Shadings. The soft glowing fabric vanes glide on a sheer backing, providing you with infinite combinations of view-through, light control, and privacy. 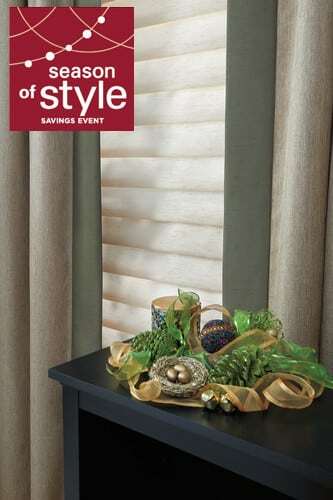 Purchase 2 Pirouette® Window Shadings to receive $100 rebate, plus $50 rebate for each additional unit. A window blind that provides sophisticated style and brilliantly engineered grace. The Silhouette® Window Shading features soft, adjustable S-shaped vanes floating between two sheer fabrics to create infinite light-control possibilities. To ensure privacy and control the amount of light entering your home, simply tilt the vanes. Silhouette® Window Shadings are extremely easy to operate and you can motorize them with Hunter Douglas PowerView® Motorization. 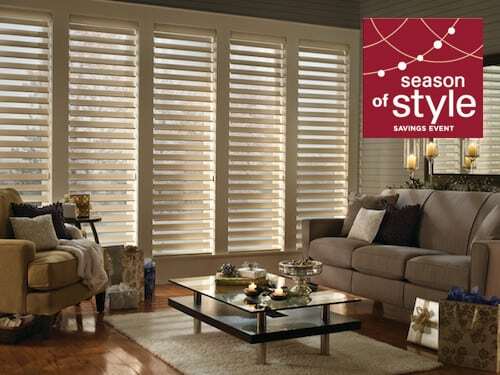 Purchase 2 Silhouette® Window Shadings to receive $100 rebate, plus $50 rebate for each additional unit. The traditional roman shade without exposed rear cords is one of the most popular window treatments. Luxurious fabrics with folds can be custom made into a flawless roman shade to fit your exact window specifications. Purchase 2 Vignette® Modern Roman Shades to receive $100 rebate, plus $50 rebate for each additional unit. For an energy-efficiency window blind that helps reduce your energy bills all year round consider Duette® Honeycomb Shades. The Honeycomb cells are engineered to trap air for superb window insulation. Purchase 4 Duette® Honeycomb Shades to receive $100 rebate, plus $25 rebate for each additional unit. Combining the energy-efficiency of a cellular shade with the modern sleek design of a roller shade, Sonnette™ Cellular Roller Shades have soft curves and beautiful colors. Add subtle style to your home décor with the latest Hunter Douglas cellular roman shade available in SoftTouch™ Motorization. SoftTouch™ Motorization is an innovative wand operating system perfect for pets and child safety since its cordless. 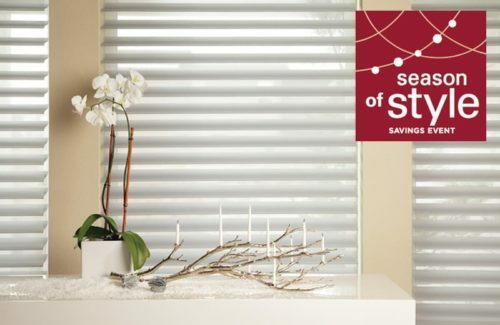 Purchase 4 Sonnette™ Cellular Roller Shades to receive $100 rebate, plus $25 rebate for each additional unit. 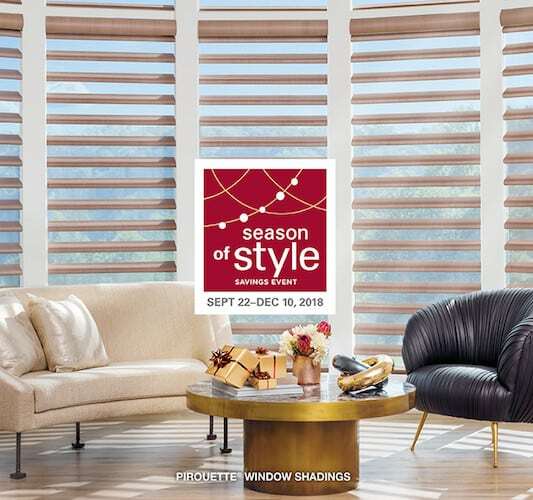 The Hunter Douglas Season of Style event ends December 10th, 2018. All Hunter Douglas window blinds and shades are available in a wide variety of colors, textures, and fabrics. Select from different fabric opacities such as light diffusing sheer fabrics, room darkening or blackout fabrics. 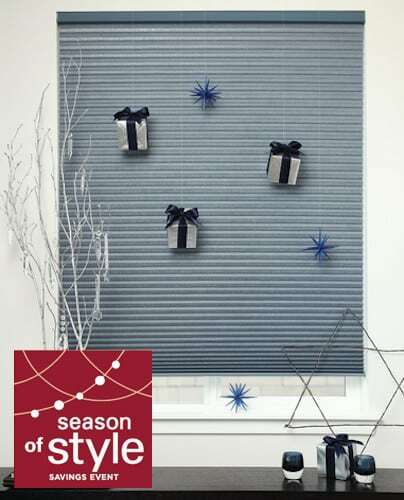 Maybe updating your window blinds and shades won’t be enough to update the look of your home for the holidays. You can even consider updating your slipcovers on your loveseats, sofas and chairs to help protect them from damage and spills. Updating worn out furniture with new fabric upholstery will add life to some of your old-time favorite chairs, recliners or sofas. You can also match your soft furnishing and fabrics to your window coverings, cornices and valances. Choose warm colors and rich textures to enhance the ambiance throughout your space. United Decorators can handle all your Hunter Douglas window blinds and shading needs, custom draperies, slipcovers and upholstery projects to help get you ready for the holidays. Contact us or call us at 718-253-9300 to schedule your FREE design consultation and get holiday ready early this year.